Let the J. J. Keller® Encompass® Fleet Management System streamline your driver compliance tasks, so you can spend more time running your fleet. J. J. Keller's Encompass® system is the industry's most versatile online tool for improving driver and vehicle compliance. Featuring a series of regulatory dashboards, exceptions-based reports and compliance alerts, it offers a real-time view of the critical fleet information you need. 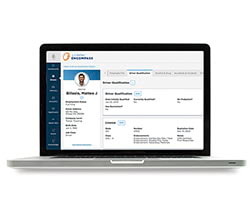 Drivers – Get complete visibility of your driver and employee records and streamline daily tasks via reporting and alerts that allow you to proactively manage personnel and improve productivity and your CSA Driver Fitness scores. Vehicles – Eliminate out-of-service downtime and keep your trucks running smoothly with powerful reporting that helps you track vehicle maintenance, unit location, repairs and outside costs, and related unit requirements like IFTA and IRP. Performance – Get real-time views of driver and unit performance to create impactful training, policies and procedures that improve your business and customer service. Manage risk behaviors and improve routes, fuel use, and idle time. Let Encompass be your compliance management tool! Fill out the form, and we'll get back to you. Or call 855-693-5338 and we'll be glad to help you right away!